Looking for the history of the Gunflint Trail - its people, resorts and stories. Check out the new Gunflint Trail history blog. This interactive website not only presents Gunflint history, it provide you with the opportunity to share your gunflint historical memories- the history of your cabin, your lake and your neighbors. Rcently received the following question from Dan Nelson, son of the former owners of Clearwater Lodge -Dan ask, "does anyone have some good history about the gangster who had a cabin on Hungry Jack?What about other underworld stories? I have heard some resorts had slot machines back in the day. Would they have been legal?" The "gangster" cabin Dan refers to is the former cabin of Tommy Banks, who was involved with the Minneapolis mob during the 1930-40's. The cabin is part of the Hungry Jack Lake Summer Home group three cabins east of Hungry Jack Lodge. One of the stories I know about Tommy Banks was told to me by Billy Needham, before is death. Billy lived on Hungry Jack Lake for many years and took care of Tommy's cabin and was his fishing guide. According to Billy on his first fishing trip out with Tommy and several of his bodyguards they were fishing out of a large canoe on Rose Lake when someone in the party hooked a very large northern. After a long battle with the fish it was finally brought up to the canoe. However, Billy upon see the fish realized it was too large to bring into the already crowded canoe and he started to pull out his hunting knife to cut the fish loose. With that Tommy's bodyguards all drew their pistols and dispatched the fish in a blase of bullets. We are looking for more stories about Tommy Banks and other mob connections with the Gunflint. How about the alleged bootleggers trail from Canada down the old South Lake Trail coming out near Northwoods Lodge? Did the bootlegger really stay at the lodge's old log bunkhouse one night and the revenuers the next night? If you have any stories let us know. Cairns are mounds of stone erected as landmarks or monuments. They were of Celtic origin. 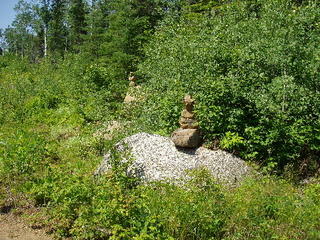 There are many recently build cairns around the Gunflint Trail. Here are a few (click on image for larger view). If you know of others please let us know where and its history. If you can get a photo of it we will add it to the others displayed here. Cairn located at top of the Northern Lights Lake hill. 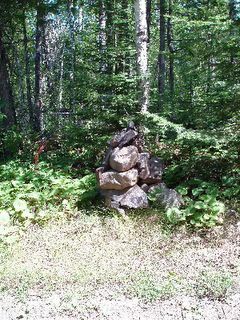 Two Cairns (above) along the Tall Pines Trail to yurt constructed by the Nichols family on Little Ollie Road, in the fall of 2004. The Nichols have a cabin on Little Ollie Lake. 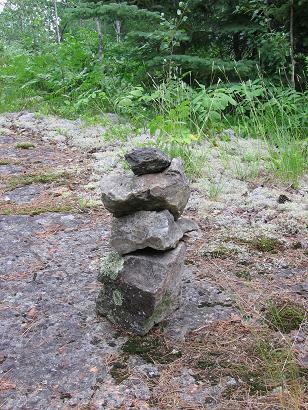 Additional cairns can be seen along the Magnetic Rock Hiking Trail and one along the Shoe Lake Road near Greenwood Lake. 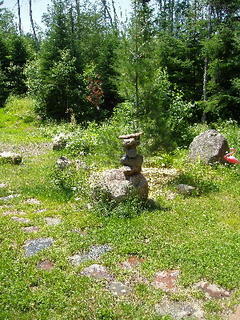 These cairns will be added to this article when we have photos. On Thursday, July 7, Congressman James Oberstar meeting with some fifty-five Gunflint Trail area residents and business listen to their concerns and promised to do what he can to help. See the Issues Statement passed out at the meeting. Perhaps the must contentious issue brought-up was the Border Patrol's "I-68 permits. The Border Patrol is now requires any person traveling from the U.S. into Canada and returning at any location other then an official border crossing, i.e., Grand Portage, must have in their possession an "I-68" form. This means if you go fishing through Saganaga into Caches Bay or Northern Lights or are on a canoe trip where you cross into Canada at anytime during your trip you must have this form with you when you re-enter the U.S.
Several U.S. citizens with cabins on the Canadian side of Lake Saganaga expressed their annoyance with this regulation. Their main concern was how difficult it will be to comply. They stated that the Canadian's Cross Border Permit, which is also required for them to get back and forth to their cabins, is relatively simply to obtain and comply with but this is certainly not the case with the U.S. "I-68" form. They went on to ask, why does the Canadian government treats U.S. citizens better then our own government on this issue? Barbara Gecas of Heston Lodge questioned why she had to be finger printed, which the "I-68" requires, just to cross Gunflint Lake for a picnic on the Canadian side. Congressman Oberstar agreed that the "I-68" was much to cumbersome and had to be changed. He promised to meet with Homeland Security officials, who came up with the regulation and form and to demand that they develop a much more sensible user-friendly program. Many people attending the meeting expressed their displeasure with a number of recent actions by U.S Forest Services. They question the Forest Services' plans to designate the Vegetable Chain of Lakes as a Non-motorized area. It was argued that Forest Service slip this designation into the latest U.S. Forest services Superior National Forest Management Plan at the last minute of the planning process. Oberstar agreed and stated the while his staff normally checks all Forest Service documents very closely, "they 'broadsided' us on this one." And he promised to get to the bottom of why this happened. McReady, President of Conservationist with Common Sense (CWCS) and who had traveled to the meeting from Ely reminded the Congressman that the Forest Services' Plan also designates the Big Lake area as non-motorized. And this, according to McReady could jeopardize a planned snowmobile trail along the Echo Trail west of Ely. Dave Beattie from, Moosehorn B&B, express his concern over the Forestry controlled burn program. He stated that while they had promise to restrict burning, as much as possible, up to the waters edge on lakes and along the edge of the Gunflint Trail. The Forest Services pretty much has ignore these promises. Beattie went on to state that, "he blamed Dennis Neitzke, Gunflint Ranger District for this, the Vegetable Chain and the other damaging actions recently initiated by the Forest Service in the District. The question was also raised why the Forestry had done so little to reduce the fire danger in the BWCA. A fact sheet handed out at the meeting stated, "The original BWCA's Fuel Treatment Plan stated that 73,124 acres were to be treated within the BWCA by 2007 of which over 56,000 acres were to be burnt by 2004. To date it appears that only a fraction of this goal has been met. With one hundred and eleven miles of fire control lines that must be cut by hand (no power tools) required for these BWCA burns, it is little wonder that so little has been accomplished! Our question is if the fuels buildup in the BWCA was such a threat to the residents of the Gunflint as the Forest Service told us, why is the job not getting done? And most importantly why waste precious time using time consuming hand tools?" A discussion then followed over the Forest Services time consuming and wasteful policy requiring that only hand tool can be used in maintaining the BWCA. Jim Raml, from Seagull Lake, questioned the Forest Services' BWCA Day Use Permits which he stated, "provide no useful or usable information," and since the Day Permit programs was originally to operated for only three years, "why is it still going on, costing money and providing only worthless information. "The real purpose of the Day Permit is for the Forestry to use it as a method of control over the people of the area," Raml when on to state. In response to the many concerns about the Forest Service Congressman Oberstar stated that he has noted these concerns and will hold a meeting with James Sanders, Superior National Forest Supervisor to discuss these concerns. Following the meeting as Congressman Oberstar was greeting participants Dave Beattie present the Congressman with a "Dump Dennis ~ Save the Vegetable" bumper sticker. The sticker is being handed out throughout the county and is in reference to Dennis Neitzke and the Vegetable Chain issue as symbolic of the many recent anti-locals and anti Gunflint Trail business actions taken by the Gunflint Ranger District. The Gunflint Trail Corridor Management Program (CMP) is under way. The committee headed up by Nancy Seaton, Barb Young, Linda Hendrickson, Sue Prom, the USFS, the DNR, and others is working together to provide some amenities along the Gunflint Trail. Picnic tables, historic plaques, fire grates, and wilderness latrines are examples of projects that this "Gunflint Trail Scenic Byway" committee would like to see happen. In a related matter, the DNR is planning to close the picnic area at Chester Lake in the Hovland area. I am asking that the county oppose this, and if you feel the same, please contact Mark Kovacovich at DNR headquarters; 1568 Hwy 2, Two Harbors, MN 55616 or e-mail him at Kovacovich@dnr.state.mn.us. There will also be a public meeting on July 19 at 4:00 p.m. at the park office at Judge Magney State Park. If we want to add amenities in one area of the county it seems counter-productive to close them in other areas. Congressman Oberstar has graciously offered to meet with members of the public during has vacation time at Gunflint Lodge. He will be available at the Gunflint Conference Center at 8:00 p.m. this Thursday evening, July 7. At our June 21st Commissioner’s Meeting we accepted a Firewise Grant for the Gunflint Trail area. Maple Hill and Devil’s Track did this last year. If you are in the Gunflint Trail Area you will have an opportunity have your property evaluated for fire prevention and access should it be needed. Contact your fire departments for more information. Park and Recreation fund grants: At our June 21st meeting we approved grant requests for Cascade/Deeryard trail improvements, Superior Hiking Trail, Ski and Run Club, Tennis Association, Banadad Ski Trail widening, Dragon Boat Festival, Sugarloaf Interpretive Center, Sugarbush Trail Association, Lutsen picnic shelter, Snowmobile Club, Curling Club, and Schroeder picnic tables and dock. The Grand Marais Rec Area request, and the all-purpose soccer field request were put on hold pending Jan Hall’s return. The vote was tied in each case 2-2 so she will need to break the tie. FYI, I voted for both of these requests. Needless to say we are disappointed in the Minnesota Legislature and Governor. The State shutdown will affect us greatly if it is not settled soon. We rely on State funding for many of our programs, especially in the health and human services department. We will use county reserves to keep us going, but state funding needs to come soon to repay those reserves. If you wish to reply to me please hit the reply button and let me know what you are thinking. I have learned a lot from those of you who have been doing that, and I will reply to you as best I can.